Product: Mashers Sekipack 370ml Round Plastic Disposable Salad Container with Lids, Packs of 5 was added to cart. Serve up your salad lunch in style with these versatile Disposable Plastic Salad Containers with Lids by Mashers. A fabulous choice for packed lunches, picnics, summer BBQs, and banquets, they are made from quality transparent plastics, equipped with self-sealing lids, and they feature a square shaped base for stability on all table tops and flat surfaces. 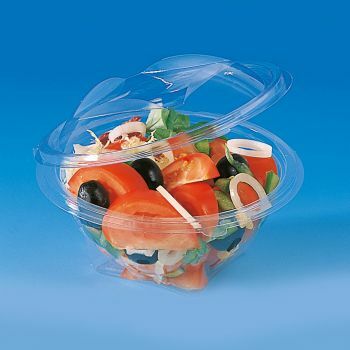 Perfect for serving salads, crudité, finger foods, and fruit salads, these disposable plastic containers with lids are a great investment for both professional caterers and everyday home use.